Protection from fire starts with making sure your fire extinguishers are ready to go. Fire extinguishers are the first line of defense and a valuable means of egress during an emergency. It is important that you are properly testing and inspecting each unit in your building and that's where Fire Protection Compliance can help. When used properly, a portable fire extinguisher can save lives, and property, by extinguishing or controlling small fires in your building while you wait for the fire brigade to arrive. If you need help choosing a fire extinguisher, or if you need fire extinguishers serviced, pressure tested, or recharged, call today. Unsure of what size and type of fire extinguisher is right for your business or home? Need help on where your fire extinguishers should be located? Fire Protection Compliance has qualified staff with the expertise and knowledge to help you choose the correct size, number and type of extinguishers to cover your building. Fires are classified based on their primary fuel type, these classification codes are used in the application of fire extinguishers. Wood, paper, cloth, plastics, rubber, coal, carbon-based compounds etc. Petrol, oil, paint, thinners, kerosene, alcohol, etc. L.P.G., Butane, Acetylene, Hydrogen, natural gas, and Methane etc. Magnesium, aluminium, sodium or potassium etc. Cooking oils and fats usually found in industrial kitchens etc. Fire Protection Compliance can ensure your fire extinguishers are serviced, pressure tested and recharged, so they are ready when you need them. All portable extinguisher technicians are trained, tested and licensed to service and recharge portables. You have your fire extinguisher – now make sure you know how to use it! To extinguish a fire with a portable extinguisher, a person must be able to access the fire extinguisher, know how to activate the unit and know how to apply the agent effectively – all in the span of a few seconds. 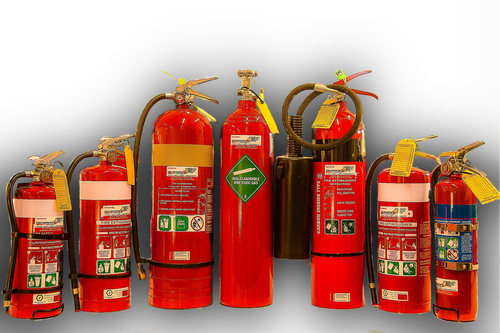 Fire Protection Compliance Ltd can provide fire extinguisher training for groups of employees to properly and safely use portable fire extinguishers. Call to book fire extinguisher training.